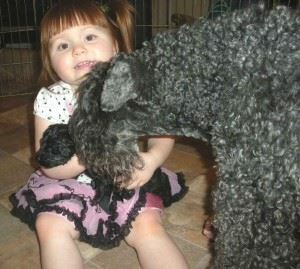 Allow the dog to sniff items the baby will be using so the dog’s scent will be on the items. This is sanitary because dogs can pick up scents even after clothing has been laundered. Handle a doll like a baby and introduce your dog to it using the word “baby.” Have the dog sit or lie down whenever he is near the baby. Train your dog if your dog has not been trained yet. The dog needs to learn to sit and heel. Introduce your dog to toddlers away from his territory, then on his property, and finally in the house. Get the dog accustomed to a baby’s cry. You can do this by tape recording babies at the hospital. Let him investigate, but with all four feet on the floor. After the baby is born, have the mother enter first without the baby. Then introduce the dog to the baby’s items and then the baby. Do not let the baby interfere with the dog’s regular times with you (i.e. feeding, walks, play time). Never leave your dog alone with the baby and do not let the dog sleep in the baby’s room. Remember, also, children can hurt dogs. Don’t get a dog for the baby; the baby is too young to learn about it. It is not a good idea for them to “grow up together” because you’ll be too busy to attend to the needs of both. Teach your child that a dog needs quiet when sleeping and eating. Teach your child how to correctly pet the dog. And remind your child not to pull on the dog’s ears, tail or coat.